I so wanted to like Swan Lake Pub Edo Roppongi but I left feeling cold and done over. Having visited two of their other branches in Tokyo – the Kyobashi branch and also the Tamachi branch – this one just pales in comparison. The beers are some of the most expensive in the area and the dreaded table charge rears its ugly head again. The saving points of Swan Lake Pub Edo Roppongi are that it is non-smoking, has an English menu and speaker, and also some free WiFi too. Personally, I’d go to either of the other two branches or if you’re in Roppongi, try somewhere else such as Gori Gori just down the road. Swan Lake Pub Edo Roppongi, part of the expanding Swan Lake Pub Edo chain in Tokyo, is the fourth in the series of tap rooms in Tokyo for Swan Lake Beer, based out in Niigata, Japan. This branch opened in March 2018, the first of two to open this year with Kichijoji being the other. Roppongi is fast becoming the latest area in Tokyo to open a craft beer bar, bringing the total number in the area to 7 at the time of writing. Swan Lake Pub Edo Roppongi is located about 2 minutes from Roppongi station. It’s found away from the famous Roppongi sign, being located closer towards Roppongi Hills, down a back street road where you can smell Gori Gori Taproom’s cooking. There is space for about 30 people inside, mostly dotted around various tables; however, there appeared to be a counter area that wasn’t in use the day we went. The whole place is non-smoking, but the dreaded table charge makes an appearance at ¥500 per person. You get a couple of deep-fried food on sticks, but it’s one of the most expensive table charges we’ve come across in our drinking days for BeerTengoku. There was some free WiFi which made the charges slightly bearable. There are 12 taps on at Swan Lake Pub Edo Roppongi with the majority of them being beers from Swan Lake. The rest are either guest collaborations or guest beers on tap. The beers come in two sizes: small (250ml) from ¥600 to ¥787, and large (500ml) from ¥980 to ¥1019. There were beer flights or happy hour offers going on, again reinforcing our preferences for the other two locations we’ve visited to date. None of the prices include tax, so make sure you add that into your (already expensive) bill. The menus had a smattering of English on them but one of the bar staff did speak fluent English without us asking – very impressive. The food at Swan Lake Pub Edo Roppongi is based around vegetables with fish, either in their fresh form or in the form of tempura! 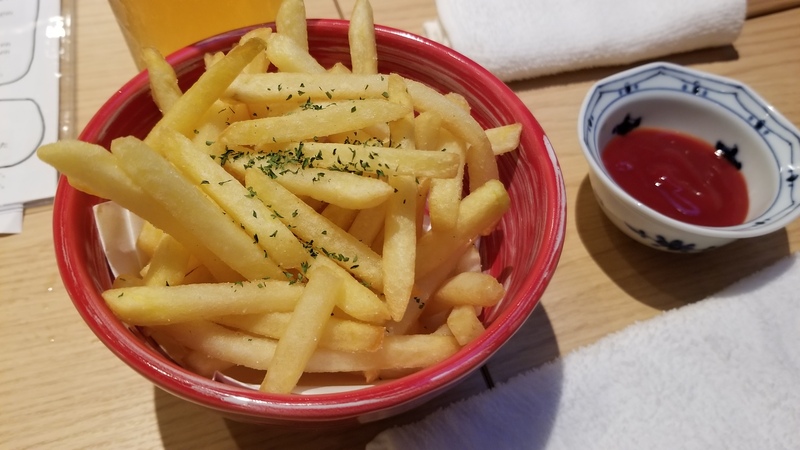 But after having some tempura at Gambrinus Roppongi previously, the only thing I wanted was chips – and we got some. The food menu was all in Japanese; however, our new found friend did translate everything without us asking. Like the drinks menu, none of the prices include tax either so add that on to your (super super expensive) bill. The closest station to Swan Lake Pub Edo Roppongi is Roppongi on the Tokyo Metro Hibiya Line (H-04) and the Toei Oedo Line (E-23).